What Can Your Tires Tell You About Your Car? Tires are the silent, nameless heroes of your car, and your personal safety. They’re often overlooked as vital features to a vehicle, particularly as safety items, thanks to all the other neat accessories cars have these days (i.e. cup holders). As your car’s only connection to the road, your tires can tell you more than the conditions of the road. They’re often the first place a potential car problem can appear, making it important that you know how to ‘read’ your tires. We’ll offer insight on what your tires can be telling you, and what these warning signs could mean. What It Looks Like: Only the middle of your tire is worn down. What It Means: Center tire wear indicates the tire was overinflated, causing just the center ring to come in contact with the road. With only a fraction of the tire touching the asphalt, a car’s traction will suffer as a result. For optimal tire pressure, double check the door placard or your owner’s manual. If the weather is cold, check the pressure before you head out. Some people believe over-inflating tires is good practice, thinking it would reduce rolling resistance and increase fuel economy. They couldn’t be more wrong. Sure, you may save on fuel, but then pay heavily for prematurely worn-out tires. If tire pressure is correct, and you still see center wear, this could signal that the wheel and tires are not a proper match. The only caveat is if you’re driving a high-performance sports car; some rear-wheel-drive, high-powered vehicles will produce center wear, regardless of proper maintenance and inflation. Have center wear on your tires? We can change them for you entirely, or correctly air them up for optimal tire performance and safety. What It Looks Like: Cracking…and bulging…tires. What It Means: A tire that’s cracking and/or bulging is typically the result of hitting a pothole, curb, or debris. If you see large cracks on the sidewall, running along the rim, it’s likely impact-related, or the result of underinflation. 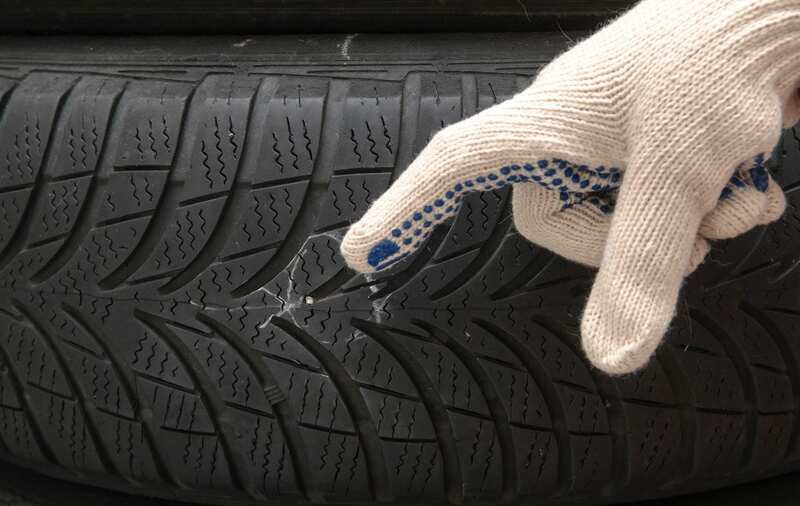 Multiple, smaller cracks in the sidewall or tread blocks can be from exposure to the elements, and age. Bulges are almost like pimples to a tire, most prominent on the sidewall. They occur from an impact, but the damage is internal – which won’t show up for weeks, maybe months, down the road. The best remedy for cracking or bulging tires is to look for a new set of tires. They must be removed from the road, as they will eventually fail. What It Looks Like: Cupping or scuffing, but as the name suggests, in a diagonal pattern. What It Means: Most common on the rear tires of front-wheel-drive vehicles, this tire issue is due to an incorrect toe setting. Poor tire rotation intervals can also cause a diagonal swipe, as can carrying heavy loads in a trunk or cargo space. This changes the geometry of the suspension, creating that distinct diagonal swipe. What It Looks Like: The tire will show ‘feathering’; tread blocks shaped like various ramps, in a diagonal wear pattern that travels front-to-back across a tire. The leading edge of the tread block is typically worn smooth – the trailing edge will be sharp. What It Means: Heel-toe tire wear is so common on tires, some drivers believe it’s the natural progression of the rubber. This frequent tire problem is the sign of insufficient tire rotation intervals. To prevent heel-toe tire wear, keep up with your car’s maintenance schedule. Misalignment, or worn/damaged suspension bushings, ball joints, and wheel bearings can also lead to heel-toe wear. Not sure what your tires are trying to tell you? Tire Butler’s mechanics are tire whisperers, able to pinpoint and diagnose exactly what your tire troubles could be, and offer affordable solutions. Toronto’s top mobile tire repair and replacement service, we’ll help you select the right tires, and deliver and install them at your convenience!